You are here: Home » News » News & Updates » Giant Fighting Robots? Let the Battle Begin! ← By Jove I Think They’ve Got It! Is This The Future of Metal Alloys? Giant Fighting Robots? Let the Battle Begin! The dream of robot enthusiasts all over the world has finally come to life. The USA industry MegaBots has challenged Japan’s Suidobashi Heavy Industries to a giant robot battle; and Japan accepted! With the fear of sounding like an over excited child; isn’t that amazing? We simply adore robotics and the ingenious engineering minds behind them. The skill and imagination it takes to transform a… well Transformer, from our TV screens and comic books, into real life is astounding, and the possibilities it creates are endless. Though these bots didn’t crash land from a far off galaxy, according to The Engineer they were first developed to help find them. Humans are physically unable to handle high pressure environments. Giant robots were first created to help aid our exploration of space, Mars exploration missions and deep sea adventures. The stand on giant robots took a humanist turn in the wake of the devastating nuclear disaster at Fukushima, Japan, in 2011. In the wake of the this catastrophe, the US Defence Advanced Research Project Agency (DARPA) set its focus on using giant robots in high risk situations as disaster-relief technology. The movement would include using robots in the wake of major natural disasters such as earthquakes, floods and- in the small chance of a similar disaster occurring- nuclear explosions. Why a Giant Robot Fight? 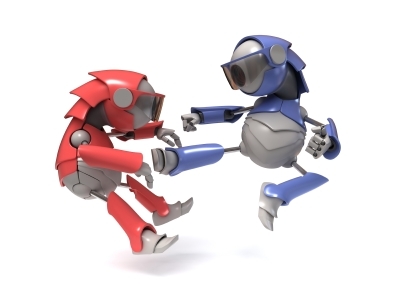 Robot fighting has littered our media for years. We have comic books dedicated to robot fighting and recent blockbusters such as Transformers, Real Steel and Pacific Rim have catapulted our robot loving imaginations into new territory. We want to know everything we can about robots. We want to push our engineering masterminds to their absolute limits and, so far, it’s paid off. Engineers have created self-aware robots and humanoid robots, sparking a mixture of fear and wonder around the world. The only problem with research into robotics, however, is funding. Mechatronics requires more research, and for that it requires more funding. This latest robot stunt has produced a burst of investor interest in the upcoming giant robot battle set to take place July 2016. The hope is that it will help to further fuel innovation activity into robotics. In all of the excitement surrounding this giant Rock’em Sock’em match, we forget about the components making up giant robots. One component we simply can’t ignore is the compression spring. Without it, robots wouldn’t be able to move quite so easily. Made to absorb energy, we’re proud to say that we’re the best compression spring manufacturers in Europe. Though we aren’t helping to build any giant robots yet (or are we? ), if you need the help of a trustworthy, quality compression spring, we’re here to help. Contact us today on 0208 663 1800 to find out more!